The time is now. the world of SEO is continually changing at the lightning speed. It’s 2017, and you should have better planning, strategies for your business. If you are rethinking of better SEO strategies, you are at a good place. We can guarantee that these 35 SEO Tips will boost your traffic if you follow them wisely. Here are some most important 35 SEO tips and tricks you should keep in mind for better SEO. Internal links are hyperlinks that show others pages of the same domain whenever clicked. Internal links allow users to navigate a website well. Using Internal links properly improves website ranking. They help spread the link juice around the site which is very important. They take visitors to an important and valuable page. So it is very important to use Internal Links on your website. On Page, optimization is the most important part of SEO. You can increase website traffic, leads, and sales, by doing better On-Page SEO on the website. You can better optimize your website according to SEO point of views. Advanced ON Page SEO Techniques used to promote your website on google. For Quick page load time, removed everything that slows down your website. To make a website appear on top of the search results is one of the hardest jobs for everyone. There is no magic to bring genuine traffic to your website. however, search engine always rewards the website who publish fresh and useful content for their visitors. a site which has some unique and fresh content will always gain more exposure in search results. This is the best way if you want to increase your business in the Local area and grab some local clients. For example, if you offer graphic design services in London. So that it’s a good idea to include “London” in your website keyword. So finally your keyword phrase will look like “Graphic Design services in London“. You just can’t ignore Image optimization for your website. All your website images should be optimized well with proper “Alt Tag”, “Image Size” and “Image title”. For WordPress Users: WordPress gives an option in which whenever you upload an image to your WordPress site, you can set image “Title” and “Alt tag”. Some sites use numbers, short words (ex. ?p=25, abs.html, xyz.html) in their permalink structure. Don’t ever do this. That’s Bad in the case of SEO and also doesn’t look good. Make sure your page’s permalink include at least 2-3 keywords. and always try to use better and clear permalink. Do Url shortener impacts on your Website SEO? Yes, they do only if your URL structure in more than 100+ characters. if your URL structure is already less like 50-60 characters then you don’t need to take a headache. Short URL are easier to copy, paste, to embed and share on social media. So always try to use approximately 50-60 characters in URL. Search engines want Fresh website content. if you provide fresh and unique content frequently then search engine like google will definitely reward you in terms of better search ranking. For this, you need to keep updating your content. that’s why Directories (like Wikipedia) and blogs do well and gets better search results. because they constantly update their content. 13. Does domain Age really matter? Domain age is quite important in SEO. The key point here is an Old domain that has been already well established earned a good reputation and great trust from Google as compared with a new domain which is not established well. Stop changing your domain name. Choose a better domain name and move on. Canonicalization is essential to creating an optimized website. First, you need to decide what should be your full domain URL. In simple words, Your domain should contain “www” or it should not. If you want “www” before your domain URL, then don’t forget to 301 redirects another one to it. For example: if “www.yourdomain.com/” is your preference then “http://yourdomain.com/” should redirect to it. External links are very important. it tells Google and other search engines that this site is a trusted authority on his particular topic (field). External links are basically “a vote” to another site. Top SEOs believes that external links also effects on website better ranking and its one of the important source of ranking power. Today, most of the people don’t go to google and find your stuff and services. they use social media platform instead. Social media plays a major role in website ranking, business reputation, and user trust. Link your website to facebook, google plus, twitter, quora, Linkedin, youtube and other social platforms state search engines, what websites are credible and should show on search results. Social media also helps you increase your website traffic and page views. according to a recent survey, social media can improve your search ranking by twice if you have a good sharing plan and you do stick to the plan. An outbound link is one of the important sources of ranking power. We have already told you, Why Outbound links are important. But make sure you do not include too much or unnecessary outbound link to your website. Add outbound Link to these websites only which will be helpful for your visitors. if your visitors don’t find healthy and useful information from external sites it will be a downvote from your visitors to your site. So always pay some extra attention while adding outbound links to your site. 18. Is blog commenting helpful? Blog commenting is the easiest and a pristine way to get the backlink to your website. It is a very effective way to get some genuine traffic to your website. You can use http://dropmylink.com/ site:- http://dropmylink.com/ is one of the best and highly recommended blog commenting service. in which user (active site member) can easily find the right blog to comment on. 19. Why Focus on Long Tail Keywords? Deciding keywords is an important task. Long tail keywords can help a business to show up in search engine results. Long tail keywords are four, five, six or even more words, particularly in that phrase. Let’s say you have a business which sells “shoes” in London, UK. When you type “shoes” in google search engine you will find high competition for that particular keyword. Here the idea is, you can use Long tail keywords here. like, for example, you can use “New shoe collection in London“. You can see there is less competition here when you use long tail keywords. 20. Is Blogging important for your business? You just don’t need traffic, you need right kind of traffic. Blogging is important for every business. Blogging gives you the right visitors you need for your business. Blog increase your website traffic and SEO. Fresh content is the key to success so that blog is the best key to beating out your competitors. A study shows If you don’t have a blog for your business you are already losing 50% of your visitors. Your website design should be adaptive and it should look good on each type of devices like mobile devices, tabs, or big PC. Google stated that responsive website is important and might get a ranking boost in their search engine. Some big companies also use the mDot(“m”) different domain to serve their mobile users. they have different HTML and CSS responsive codes for mobile users. Responsive websites also reduce bounce rate, so that it equals to better search ranking. Always try to be the best in your particular zone. if your website comes on the 1st page of search ranking for a specific keyword that’s good, but if your website comes in the top 3 search results, that’s Great! You should aim to be in the top 3 search results because lots of visitors don’t click on 5,6,7 or more search results on google search results page. According to recent research if your website comes on 1st page of google but isnt ranked in the top 3 search positions, you are missing 90% traffic for that particular keyword. Ranking of a website in long term is not about building large no of links it’s about creating fresh and helping content. Videos are one of the best teachers. a learner can learn better-watching videos all the time. Its a better idea to create some quick videos for your online business. They increase the time, people spent on your website also they allow you to get some quick external links from video sharing websites. We have already told you how important external links are for your website. If used properly, videos can be extremely powerful content and can help you getting better search ranking. Heading Elements: There are 6 types of Heading Elements- H1 element to H6 element. 1. H1 is the most important title of your web page, you should use only one H1 Element on a page or article. 3. Use h2 Elements for useful links groups, group template navigation etc (You can use more than one h2 elements on a single page or article). Internal Links plays Vital role in SEO. Make sure every page of your website has an internal link. means every page should be linked to at least one other page of the same domain. Search engines don’t include pages in their search results which don’t have any internal or external link. As Google is improving in its search ranking algorithms, you should be updated about all SEO News and trends. you should add new and fresh content, article whenever possible because the search engine wants fresh content. This is the secret of better search ranking. If you want new customers, new inquiries and better search ranking you should update your website frequently. Positive reviews improve your google search local listing. and it also attracts some real customers. Your business should be trusted and reliable and friendly. and you should have some real customers to prove it. And other popular directories sites. Your business should have more than 90% positive reviews. The appearance of your listing on a various search engine is known as “rich snippets“. For better rich snippets view you should use eye-catching meta title and description and you can also use starts in search listing will tend to increase click-through rate for your listing. The more often you post, the more activity you will get. Often google surprises us with some major algorithm updates that put the significant role on search results. You need to keep updated with all search engine news and trends. as 2017 is near, google might change the functionality of its search algorithm anytime. You can read some big sites in this field: SEOmoz, SearchEngineLand.com.com, and searchenginewatch.com to keep updated in SEO all the time. When you type something into Google, it shows you “Searches related to Your query”. Because these topics are hot and trending in that particular area. The related suggestions are very beneficial for targeting unique and real traffic. You win the war to bring unique visitors to your website, Now if you are not able to convert them into your customers it’s all wasted. Here “Call to Action” comes. Call to action buttons plays a vital role and are really useful in terms of websites conversion rates. conversions rate is the number of people who take some action on your call to action button or on website content that helps you grow your business. SEO is weak and useless if you don’t have a clear and non-existent call to action. When you normally clicks on a link that is supposed to take you somewhere (internal or external domain), yet instead it takes you to a 404 error page. this is called a broken link. Broken links can lead to decreasing SEO traffic for your website. google hates broken links, so you should always check your website for broken links.you can use “Broken Link Checker” WordPress plugin to scan your website for all broken links. You can use “Broken Link Checker” WordPress plugin to scan your website for all broken links. It would be better to remove all broken links as soon as possible. This technique works well if you use it as a proper way. it gives your page extra SEO weight. Don’t optimize a single page with multiple keywords, always focus on a single keyword phrase and optimize the page well. Don’t optimize a single page with multiple keywords, always focus on a single keyword phrase and optimize the page well. A search engine like google also understands and prefer the single keyword phrase better as a comparison with multiple keywords phrase. For certain queries, searchers often search use in the year. Like, for example, he wants to search “Best SEO Tips and Tricks” then lots of users also searches “Best SEO Tips and Tricks in 2016”. Using this trick give you Long tail keyword. so that user can get a better specific filtered result. We have already written SEO tips- how long tail keyword can help you get better search engine traffic. 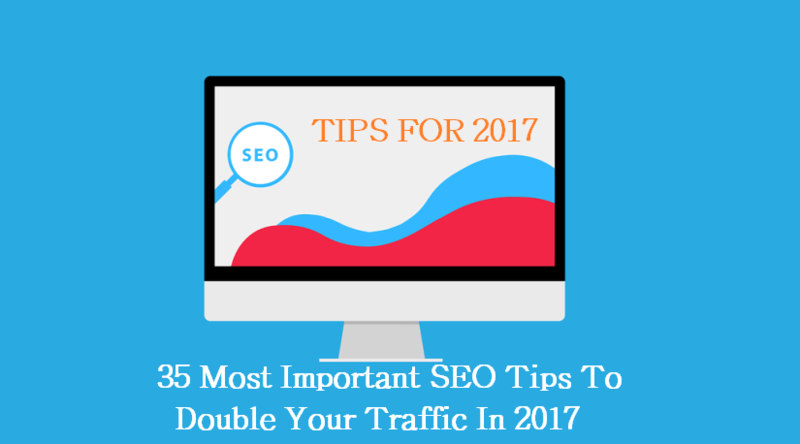 2017 will be tough, but if you follow all the tips wisely and work according to a proper plan, your website will definitely get a better rank in a search engine like Google. Always remember, SEO is not a single day process, you need to keep patience and working each and every day. We have already ranked many sites to Top of Google, you can CONTACT US at any time, we would be more than happy to help. Now it’s your turn to better rank your website. As a Blogging Guys, what is the most difficult work in SEO? You can share your thoughts in the comment area.